The Braves' Aspen Slifka scores 32 points to send Banks back to the state tournament. 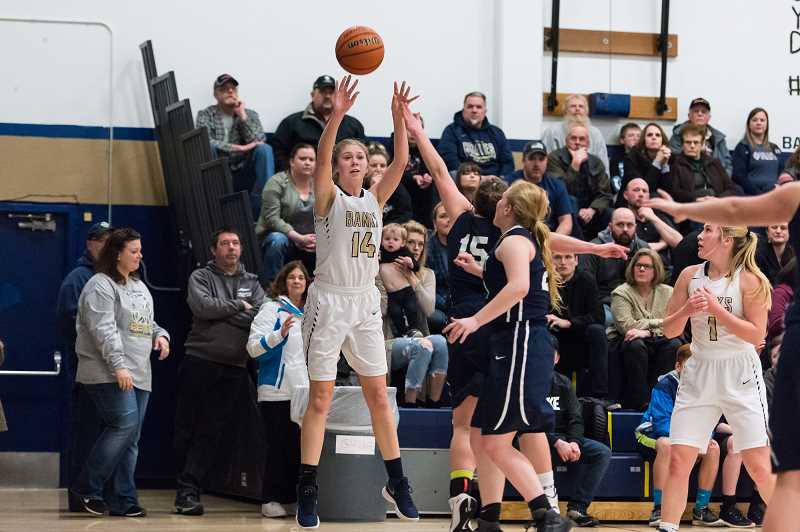 It's been three months since the Banks Braves girls basketball team started the season, and in that time they've been forced to evolve due primarily to a handful of catastrophic injuries that have altered the composition of a once formidable team. 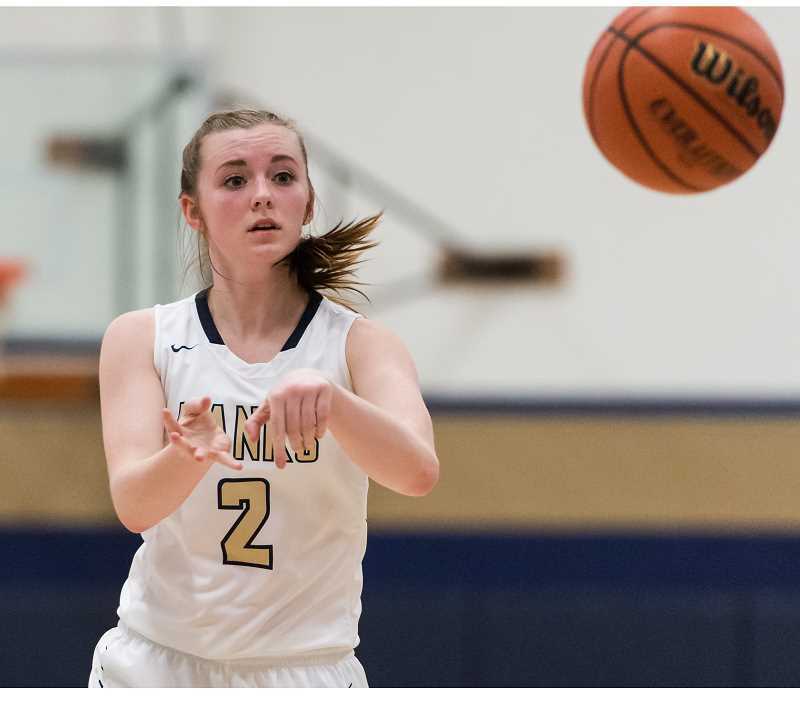 But despite the absence of invaluable components like senior post Sydney Gregg, the new-look Braves continue to win, continue to get better, and continue to advance regardless of the setbacks they've simply become accustomed to. "Our motto all year has been rise above," said Banks' standout point guard Aspen Slifka. "So fighting through all that adversity and coming together as a team again has been very important in the last couple weeks, and now we're just looking forward to the tournament and what lies ahead." And the tournament is where they're headed. The Braves defeated Newport 55-39 Friday, March 2 at Banks High School, and did so in impressive fashion. The Cubs, the fourth place team in the Oregon West Conference and No. 12-ranked in the OSAA, fought admirably, but never had much of a chance against Banks and more specifically — Slifka. The junior scored 32 points, grabbed four rebounds and imposed her will from the get-go, scoring 12 points in the opening quarter from both within and far beyond the arc. "I was really happy with the way Aspen came out," said Banks head coach Brandon Begley. "She really carried us in the beginning, then everyone else stepped it up." Newport stayed within shouting distance, trailing by just eight at the half. But the Braves locked it down defensively in the third quarter, opening up a comfortable lead and for the most part cruising to a relatively easy win. "I was a little concerned in the first quarter that we might dig ourselves a hole then tighten up a bit, but Aspen put us on her back and got us going," Begley said. "Our dynamics are different and we haven't had a long time to adjust without Sydney, so with all those young kids in there you just don't know how they're going to react in a big game. Now, knowing they played so well, they can go out there and relax and that will be big for us." Slifka, an always reluctant star, was quick to deflect credit for her team's victory after the game and even quicker to point out the importance of her teammates to her and their success. "I get all my points off of assists from my teammates and they're always there to back me up on every play," Slifka said. "So having a supporting cast like that and the way that we work together as a team, is awesome." After taking a 29-21 lead to the half, Banks opened the second half with nine straight points, including a three-pointer from Kim Jordan, two points in the paint from Jessi Wren, and four from Slifka to stretch the lead to 17. The lead would quickly grow to 19 to start the fourth, and despite a couple sloppy stints over the final five minutes, Banks would control the game en route to a surprisingly comfortable victory. "Newport is a really good team," said Begley. "But the girls followed the game plan and I'm happy with how we played. The coach was also happy with the progression his team has made over the course of the last few weeks, and is becoming more comfortable with their prospects going forward after seeing a number of the underclassmen under the bright lights of the state playoffs. "You're always a little bit concerned, especially since we have a handful of girls that haven't been here before," Begley said. "We wanted to get some of our young girls in early to see how they did and I was proud of the four freshmen who got in early." Does that mean he was surprised with how they performed? Not at all. "I feel like if you can go against our girls in practice, then you can go against anyone," he said. Now, after cementing their place in next week's tournament and setting the stage for what they hope is a long and successful run, Slifka is looking forward to whatever may come their way. "This is the second year in a row and were definitely excited to be going back," she said. "It's great that it's in Forest Grove and so close that we can have lots of fans there. We're ready." In addition to Slifka, Jordan finished with eight points for Banks, while Wren tallied five points and grabbed six rebounds. Newport was led by junior Madison Hargett who scored 15 points, while fellow junior Megan Wagner finished with 11 points and five boards. Banks is scheduled to face Baker on Thursday, March 8 at 3:15 p.m. in the tournament's opening round at Pacific University.